To Cite: Ghasemian R, Nosrati A, Nabili M, Shokohi T. Invasive Pulmonary Aspergillosis in Patients with Non-Decompensated Liver Cirrhosis: A Case Report, Arch Clin Infect Dis. 2016 ; 11(3):e36023. doi: 10.5812/archcid.36023. Introduction: Invasive pulmonary aspergillosis (IPA) is a fatal disease usually occurring in patients with neutropenia resulted from chemotherapy for malignancy. The other risk factors include consuming corticosteroids, organ transplant and advanced acquired immunodeficiency syndrome (AIDS). Recently, the incidence of IPA in immunocompetent patients without any history of organ transplant or malignancy has been increasing. Patients with advanced cirrhosis are one of the cases involved in this infection. Case Presentation: In this case study, we report invasive pulmonary aspergillosis in a 50-year-old patient (from Sari, Iran), who had gradual abdominal pain and ascites, cough and respiratory distress. Radiographic signs showed a round infiltration in the upper part of the right lung. Despite receiving 48-hour antibiotics therapy, the fever had not subsided. In CT-guided needle lung biopsy, septate and acutely angled hyphae (dichotomous) were seen. In CT-guided needle lung biopsy, septate and acutely angled hyphae (dichotomous) were seen. Direct examination of the sputum showed septate hyphae compatible with a filamentous fungus. According to morphological and molecular characterization, Aspergillus fumigatus was confirmed. Minimum inhibitory concentration (MIC) values of antifungal agents were determined based on the clinical and laboratory standard institute (CLSI) M38-A2. Treatment with intravenous amphotericin B was changed to oral voriconazole 200 mg, twice a day. The patient did not have any kind of residual lung lesion within the six-month follow-up and the cirrhosis was under control and she currently has no respiratory symptoms or signs. Conclusions: In patients with liver cirrhosis, when there is evidence of severe pulmonary disease without proper response to treatment, the possibility of invasive pulmonary fungal infection should be considered. Invasive pulmonary aspergillosis (IPA) is a fatal disease usually occurring in patients with known risk factors including: prolonged neutropenia, allogeneic hematopoietic stem cells solid organ transplantation and advanced acquired immunodeficiency syndrome (AIDS) (1). Lately, the number of IPA cases in immunocompetent patients without a history of immunodeficiency has been increasing. Patients with advance cirrhosis (especially child C score), chronic obstructive pulmonary disease (COPD) or those receiving prolonged courses of steroids are amongst cases affected by this infection. Cirrhosis is not recognized as a classic risk factor and hence diagnosis is often delayed (2). Early diagnosis of the disease is very important since it prevents mortality. In a patient with liver cirrhosis many complications may occur, such as gastrointestinal bleeding, hepatic encephalopathy, portal hypertension and infection. Most of these are fatal (3). The patients suffering from advance or acute liver failure are susceptible to bacterial and fungal infections. Infection is a common cause of death. Various different reasons can cause this increased susceptibility, such as weak granulocytic defense, augmented intestinal permeability, consuming corticosteroids, malnutrition and invasive diagnostic and treatment methods (4). Consequently, it seems that liver failure, itself, is the main reason of this fungal invasion. In this study, we report on a case of IPA, who had liver cirrhosis and survived by prompt treatment. The patient was a 50-year-old woman with idiopathic cirrhosis for five months. She was admitted during January 2014 by signs and symptoms of gradual abdominal pain and distention, cough and respiratory distress in Imam Khomeini hospital, Sari, Mazandaran, Iran. Due to the presence of fever, abdominal pain and ascites, diagnostic paracentesis was performed to rule out peritonitis, and antibiotic therapy was started with ceftriaxone and metronidazole. Chest radiography was performed in view of cough and shortness of breath, in which a round infiltration was observed in the upper part of the right lung (Figure 1A). Figure 1. A, (CXR) two Round Infiltrations in the Upper Part of the Right Lung; B, acutely angled hypha admixed by necrotic material and debris (arrow) (100 × , H&E); C, (CXR) cavitation at the site of previous infiltration (4th day); D, lung CT scan (cavity in the right lung at the site of previous infiltration)(4th day). The patient was on the following medications, furosemide, spironolactone, omeprazole, salbutamol and atrovent. She had no past history of chronic lung disease, diabetes or even use of systemic or inhaled corticosteroids. Serology for human immunodeficiency virus (HIV), hepatitis B virus (HBV) and hepatitis C virus (HCV) was negative as well. Blood culture, urine and peritoneal fluid culture for fast-growing bacteria were negative. All of the laboratory findings are presented in Table 1. Despite receiving 48 hours of intravenous antibiotics, the fever had not subsided thus; the treatment was changed to imipenem in suspicion of peritonitis and pulmonary infiltration. Eventually, she was referred to the infectious diseases service for consultation. The patient underwent CT-guided needle lung biopsy. In pathologic examination, septated and acutely angled hyphae (dichotomous) were seen, which raised the possibility of Aspergillus fungi (Figure 1B). Treatment with intravenous amphotericin B was started and the other antibiotics were discontinued. After four days of hospitalization, the patient had cough and blood-tinged sputum. Chest X-ray and lung CT scan revealed cavitation at the site of previous infiltration (Figures 1C and 1D). Since all biopsied material was sent to the lab in formalin, to identify the causing agent, multiple sputum samples were obtained over several days. Direct examination of sputum showed septate hyphae compatible with a filamentous fungus. Identical abundant Aspergillus fumigatus colonies were frequently isolated from different media and different sputum samples. Subsequently, molecular tests were performed for accurate identification of Aspergillus fumigatus. Briefly, DNA was extracted from the colony using homogenization by glass beads followed by phenol-chloroform purification, as described previously (5, 6). Polymerase chain reaction (PCR) amplification of the β-tubulin gene was performed using the primers B2a (5’-GGTAACCAAATCGGTGCTTTC-3’) and B2b (‘5-ACCCTCAGTGTAGTGACCCTTGGC-3’) with cycles of five minutes at 94°C for primary denaturation, followed by 35 cycles at 94°C (60 seconds), 58°C (30 seconds), and 72°C (80 seconds), with a final seven-minutes extension step at 72°C. Subsequently, the amplification product was purified using GFX PCR DNA (GE Healthcare, Ltd, Buckinghamshire, UK). Sequencing was performed as described previously (5, 6). The obtained sequencing data were adjusted using the Lasergene SeqMan software (DNAStar, Inc., Madison, WI, USA) and compared with GenBank and through local blast with a molecular database maintained for research purposes at the CBS-KNAW fungal biodiversity centre, Utrecht, the Netherlands. The comparative DNA sequences analysis by nucleotide basic local alignment search tool (BLAST) showed that the amplified sequence had 99% identity with the beta-tubulin genes of A. fumigatus with GenBank accession number KJ175505.1. The β-tubulin gene sequences of the isolate were submitted to GeneBank under accession number (KX171713). After a week of treatment, the fever subsided, and the patient recovered gradually with no hemoptysis. Two weeks later, the intravenous Amphotericin B was changed to oral voriconazole 200 mg twice a day. Pulmonary lesions disappeared completely at the end of the 6th weeks of treatment, so the drug was discontinued. The patient did not have any kind of residual lung lesion within the six-month follow-up and the cirrhosis was under control and currently she has no respiratory symptoms or signs. The in vitro antifungal susceptibility tests of isolated A. fumigatus were performed using the micro dilution method of the Clinical and Laboratory Standard Institute (M38 - A2) (7). Briefly, the antifungal agents were dispensed into microdilution trays at final concentrations of 0.016 - 16 µg/mL for amphotericin B (Bristol-Myers Squibb, Woerden, the Netherlands), itraconazole (Janssen research foundation, Beerse, Belgium), voriconazole (Pfizer central research, Sandwich, United Kingdom), posaconazole (Schering-Plough, Kenilworth, STATE, USA) and caspofungin (Merck Sharp & Dohme, Haarlem, the Netherlands). Inoculum suspensions were prepared from five-day-old potato dextrose agar (Difco) by slightly scraping the surface of mature colonies with a sterile cotton swab wetted with sterile saline including Tween 40 (0.05%). The supernatants were adjusted spectrophotometrically at a wavelength of 530 nm to an optical density that ranged from 0.09 to 0.13 (0.5 - 3.5 × 104 CFU/ ml) and diluted 1: 50 in Roswell park memorial institute (RPMI) 1640 Medium. Microdilution plates were inoculated with 100 µL of the diluted conidial inoculum suspensions, incubated at 35°C for 48 hours, and read visually. Paecilomyces variotii (ATCC 22319) and Candida parapsilosis (ATCC 22019) were used as quality controls. In vitro antifungal susceptibility tests revealed that the MIC values for the antifungals used in this case in increasing order were posaconazole (0.125 µg/mL), itraconazole and voriconazole (0.5 µg/mL), and amphotericin B (1 µg/mL). The minimum effective concentration (MEC) for caspofungin was 0.125 µg/mL. This is the first case of IPA in patients with cirrhosis, reported in our country, Iran. Fortunately, the patient is completely cured with medication and liver cirrhosis is currently under control. No other predisposing factors including neutropenia, chemotherapy, corticosteroids consumption and HIV are found, but cirrhosis, which was merely an underlying negative factor. Some researchers have proposed that T-cell counts are correlated with the severity of cirrhosis in these patients. Moreover, liver failure itself can aggravate growth and invasiveness of fungus in the lungs. In our patient, WBC count was normal at the beginning of the disease and the number of lymphocytes was 2700 cells per micro liters. Prodanovic and colleagues reported three cases of aspergillosis in patients with decompensated cirrhosis (8). All three cases had advanced liver cirrhosis with signs of Acute Respiratory Distress Syndrome (ARDS), sepsis and shock. They showed pulmonary infiltration and were only seropositive for Aspergillus, yet no biopsy was taken and no culture was done. The patients were treated by voriconazole for IPA. Unfortunately, all three patients died despite antifungal therapy, where one was treated with oral corticosteroids. Chen et al., introduced 19 patients with liver cirrhosis whom contracted IPA (3). Their risk factors were a high degree of Child-Pugh score, broad-spectrum antibiotics and corticosteroids therapy. In 11 out of 17 patients, who had died, the direct cause of death was IPA. The other causes of death were hemorrhage (two cases) and hepatorenal syndrome (four cases). Only two patients survived (3). The risk of IPA was estimated as 3/1000 in cirrhosis. Culture, biopsy, serological and radiological findings are all helpful in making the diagnosis of IPA. Culture results certainly require a longer time. 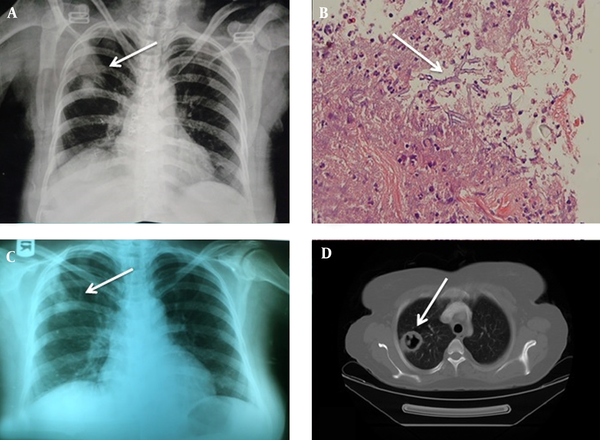 Radiological findings including presence of air crescent or halo sign suggestive of aspergillosis can be helpful in the treatment of early lesions. However, studies have suggested that in non-neutropenic patients these typical findings are less seen (9, 10). The positive culture is not sufficient alone and BAL, serologic studies and semi- quantitative culture are all needed to confirm the diagnosis (9). The IPA-related mortality in cirrhosis has been reported to be 40 - 90% (3). The mortality rate is different regarding the severity of underlying liver disorder, taking steroids and type of antifungal treatment (11). The effective treatment against invasive aspergillosis includes a variety of compounds such as caspofungin, amphotericin B and voriconazole. Chen and colleagues reported that the survival rate was higher in patients who took voriconazole (3). Caspofungin may be the better choice due to having no interference with cytochromes P-450 enzymes in the liver and is excreted from urine (12). voriconazole has hepatic and renal toxicity, thus dose adjustment is required in the presence of liver disease (13). In this patient, we prescribed voriconazole 200 mg, twice daily. Fortunately, the patient tolerated the medication and had no side effects. The dosage of drug should be divided to a half dose in severe cirrhosis, but this should be done after controlling of initial symptoms and fever. The length of treatment of IPA in cirrhosis is unknown and it has not been clearly mentioned in the other studies. Aspergillosis in neutropenic patients must be treated for at least six weeks, according to treatment guidelines. This patient was also treated for six weeks regarding Infectious Diseases Society of America (IDSA) treatment guidelines (13). In conclusion, unexpected complications may occur in patients with liver cirrhosis, specially advanced cases, which contract pneumonia of high Child-Pugh. Thus, clinicians must be aware of the possibility of invasive pulmonary fungal infection and consider it as the main differential diagnosis; particularly, when there is evidence of severe pulmonary disease without proper response to treatment. In these cases, rapid bronchoscopy with biopsy and culture for fungi are recommended. Furthermore, Aspergillus antigen serology is useful. Radiological evidence particularly unusual infiltration and abnormal CT findings, including nodules, halo sign and segmental infiltration are all helpful. In these circumstances, presumptive antifungal therapy is recommended to achieve decisive results and prevent death. Authors’ Contribution: Roya Ghasemian and Anahita Nosrati referred the patients, designed and edited the draft of the manuscript, Mojtaba Nabili obtained the specimen, performed all tests and wrote the manuscript, and Tahereh Shokohi managed the research and edited the final manuscript. Financial Disclosure: There were no financial interests related to the material of this manuscript. Funding/Support: This study was supported by the school of medicine, Mazandaran University of Medical Sciences, Sari, Iran (Grant no. 94-499), which we gratefully acknowledge.